Alliance Town Center is a 900-acre diverse mixed-use destination that utilizes a wellness-based approach to uniting our community. The walking trails and bike routes provide walkable connection to the various entertainment, living and working options throughout, Alliance Town Center. The trails also connect to the Arcadia Park Trail System which lead pedestrians through naturalized landscape corridors and into the established neighborhoods surrounding ATC. Ample areas of green spaces throughout allow for recreational activities for residents and visitors to enjoy. A community gathering place. A pathway to health and wellness. an outdoor learning experience. Restored to its original, native blackland prairie state by Hillwood Properties, the 14-acre park is home to dozens of species of native grasslands and plants, 500 native trees and shrubs and diverse wildlife. It is a tremendous natural resource that will serve generations to come, and a community asset for the enjoyment of residents, visitors, students, families and employees of local businesses. 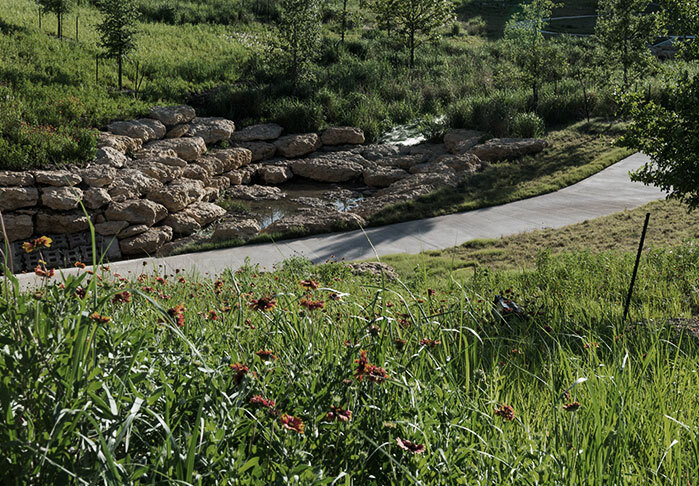 Developed in collaboration with the Lady Bird Johnson Wildflower Center and many other partners, the park honors the land’s history and natural beauty – all with sustainability and stewardship of the land for the future in mind. Prairie Vista Park, nestled on the east end of Alliance Town Center, is home to a tranquil 7-acre pond and 10-acre green space. A trail surrounds the pond where you can spot ducks and wild birds. This park is an ideal space to relax and read a book, take a scenic jog, or enjoy a picnic with friends. Whether you want to relax and enjoy the outdoors, take a rigorous run, or learn more about nature, we invite you to come out and explore today!